Are we doing to these children a favor by telling them what we are telling them? A world where the only tree that has a value is a tree that has been cut down and sold. A world where the measure of success is how much a person can consume. Education of ideals in isolation can produce a naivete of how things are in the real world and that is definitely not doing the children any favors. The two stories of the fisherman and the farmer by presenting contrasting points of view is a great approach because that way children learn about higher values and how the world actually is at the same time. With two stories children can be encouraged to identify with a good 'tribe' which respects the present and is concerned about the future without being trapped into a bubble of idealism which wolves of the consuming tribe will easily spot, shun, and well; consume! Using the two story approach higher values of living in harmony with the environment can be taught without a downside of believing that ideal values represent a real world reality which we know they absolutely do not. The danger of being out of touch with the real world is avoided by your two story approach. California, central USA, Arabia, northern India, ... aquifers provide the water for the food for hundreds of millions, if not a billio or two. A very crass case of seneca cliff. So even when we try they are not allowed to hear the message the status quo must be protected. I think this is an important post and gives us an insight into education and leadership, as distinct from 'instruction'. This is different from the usual school approach. Parables are not 'facts 'and in many cases are more important. Much of my own more important learning came this way, and needed to continue when I was older. I can think of other parables. One story for perhaps older children was told to me by an Irish labouring man on a construction site in England circa 1960. (Larger construction sites attracted experienced workers mostly from what was then still rural Eire.) He and his colleagues sometimes spoke Erse among themselves and they had a very distinctive culture. He told me that from the age of nine he followed the custom of bringing a daily barrow of sea weed from the shore to a small plot above the cliff to make soil. This was done in order that in his mid to late 20s he might be in a position to marry and start a family. This was along the west coast somewhere. Thinking of Irish history - the population for all Ireland reached a peak in the mid-19th century of about 9 million - and of course we remember the later mass-migration that followed a famine among subsistence peasant communities – we can see the historical context for adaptive behaviour. Well, yes, the 20th century and the Petroleum Age intervened. 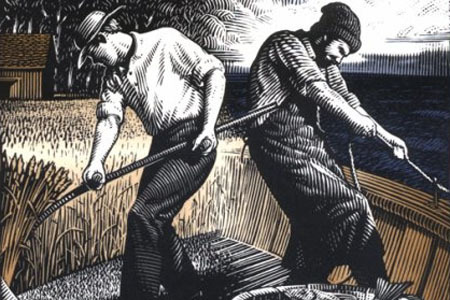 But that man's rural background still provided nutrition and strength and many tens of thousands of well-grown and healthy young men who were able to carry the weight of much of the heavier work in mainland industrial Britain even in my time. Indeed, in history we see that successful communication is made in parables. Just think of how the Gospels report the teaching of Jesus: mostly in narrative forms, ending with the note "let those who have ears, hear!". Now, of course I am not comparing myself with Jesus, but imitating him is, I believe, legitimate! Humankind has lived without an understanding of the dynamics of its environment. It has crashed and burned many times because of this indifference to dynamics. The stories we are told in school even the stories of the fisherman and the farmer contain only a sliver of the dynamic information required to create a sustainable existence. For example, in this blog, many participants know at present we have no substitution for the fossil energy we will lose access to in the next 30 years. We are facing a huge collapse of our civilization and most of the world's population, including the kids in that classroom, will die of starvation or the conflicts that arise from starvation. "We can work out the carbon budget for that. We have a carbon budget for 2°C and we can say what’s left for the wealthy parts of the world – the UK, the US, the EU, Australia, Japan and so forth. Basically, across the board, wealthier people, wealthier nations, around the world would have to reduce their emissions at about 10% every year. Just think what that means. That means that by 2020 we would have reductions of about 50%, by mid-2020s by about 75%, by 2030 about 90% reduction, and by 2035, at the outside, we’d have to remove all carbon from our energy system. Within 20 years. That’s a huge request. But, again, I think it’s just about viable. This gives us only then an outside chance of 2°C. So, this is an enormous challenge beyond anything that is currently being countenanced by any country."